"Come home at the end of the day to a richly spiced broth filled with lentils, ham and veggies. Pair it up with cornmeal muffins and you have a great meal!" 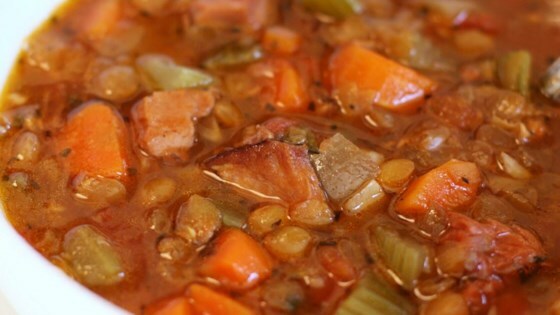 In a 3 1/2 quart or larger slow cooker combine the lentils, celery, carrots, onion, garlic and ham. Season with basil, thyme, oregano, the bay leaf and pepper. Stir in the chicken broth, water and tomato sauce. Cover and cook on Low for 11 hours. Discard the bay leaf before serving. Great recipe. I added hamhocks, and added extra water from the start. I also added a half cup extra lentils and used stewed tomatoes. Whole family loved it including kids 5 and 7. This is probably my favorite recipe for soup on this site. No changes except for cooking time. I cook on high for about 4 hrs. and it always comes out perfect.